House GOP conservatives have been critical of John Boehner's leadership and are floating Texas Rep. Jeb Hensarling as a possible replacement. Washington (CNN) - Some conservatives unhappy with House Speaker John Boehner's leadership are looking for a replacement, and recent moves by Texas Republican Jeb Hensarling are fueling speculation he wants Boehner's job in the next Congress. Hensarling, who was part of Boehner's leadership team two years ago but left to chair the House Financial Services Committee, gave an expansive speech last week hosted by Heritage Action for America, a group that frequently and publicly clashes with Boehner. More evidence that the sinister plan by Joe Biden is working. When he first put the gears in motion for the Tea Party back in 2007 as a way to destroy, for ever, the Republican party, no one would have suspected how thoroughly the destruction would be. Hensarling – " the vast majority of its taxpayer backed loans go to companies like aircraft manufacturing giant Boeing"
I agree with some of what Hensarling says about government waste, but I wonder: has Boeing ever defaulted on a loan? Have these loans cost the government any money? Singling out Boeing seems strange. Their jets are a world-wide symbol of American Greatness. Also, a lot of good paying jobs and Wall Street profits. What's not to like?? I agree, time to dump Boehner. I am sick of his whining and crying. We need a hard nosed REAL conservative as speaker. Somebody who isn't going to take BS from the minority Democrats. Somebody who will make Pelosi look like leftist fool she is. 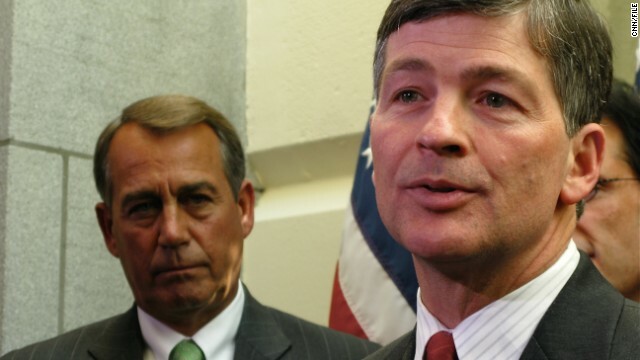 Texas Republican Jeb Hensarling will make a great House Speaker . Ken Lay, the Chief Thief of Enron, stole billions from California ratepayers, ...... Rep Jeb Hensarling of Texas, is a first class guy ...... first-class golfer, and who wife is a paid consultant . Would you mind deciphering this? What's with the mindless rambling about Enron? And what do you have against women working and providing fro their family? Right on Tommy G! Its TEA time in america!! It certainly is true Mr. Boehner is the worst and least effective Speaker in History. Under his leadership the House has passed virtually no legislation at all; brought us the government shutdown and 60 some odd symbolic votes on the ACA. I just wish they'd stop referring to these cats as "conservative". They are not. They are Right-wing ultra radicals. For the mindless living in the fantasyland of Solyndra and Benghazi, there was a little Republican, Texas oil company that wiped out the investments of thousands of Americans- a little real scandal called "Enron". It symbolizes all that is wrong with the GOP's unholy marriage with Texas oilmen. -you dream on second century TeaTrolls. No one with right mind will ever vote to these republican trash. It is The Democrats that will lead to majority. Yes, Hillary16. What you're hearing/seeing is the death throes of the Tea Bagger movement. Good riddance to tin foil hat wearing rubbish. I guess that the kind of gross mismanagement that wipes out the lives of shareholders and employees when the GOP is running everything does not bear any real scrutiny, does it? To imply that Jeb Hensarling's wife is on the same level as a struggling single mom is laughable, at best, However, if a paid lobbyist is someone you want to emulate in terms of morals, please, by all means, let us know. It only underscores how morally handicapped the Right really is. @yerkiddinright: "What you're hearing/seeing is the death throes of the Tea Bagger movement. Good riddance to tin foil hat wearing rubbish." Be sure that you and every Dem/Progessive you know gets out and votes on November 4, 2014. The gop/tea bags have well-funded ads/lies that they will saturate the airwaves with. That, along with voter suppression laws, mean every registered Democrat and Independent needs to get to the polls to ensure the gop/tea bags do NOT gain control of the Senate – and hopefully, they lose the House. Tommy G, you guys had Ted Cruz calling the shots in the house for a while there. How did that work out for ya? Can you say " government shutdown"? How about " complte capitulation"?